So, lame, pathetic, reality-hitting moment (feel free to skip): Yesterday I was hanging up SoldierMan's shirts in a rare wifely moment, and in the pile there was one that he had worn but wasn't dirty enough to go in the hamper, and as I was hanging it in the closet it passed by my face and I got hit with the remnants of the cologne he had sprayed on that day...and it just...hit me really hard. Suddenly I couldn't move, I just stood there, smelling it and crying for several minutes. I don't know if I'll let him wash any of the clothes he wears over the next couple of weeks. Expect his gym clothes. Those can definitely be washed. As an aside, how soon after they leave for basic do you know where/how to address letters? Or can I find that out beforehand? Sorry, I know that's a total n00b question. This video has gone viral the last few days with the hype over today's game, but if you haven't seen it (or even if you have) I wanted to share it with you. These guys are so impressive to me. They have a friendly, respectful relationship. In fact, ESPN reported the other night that the first text message Sam got when he got hurt a few weeks ago was Colt encouraging him. And now this video comes up. We need more role models like these guys. And not many people know how active Landry Jones is in church. He goes to my church and his parents are the directors of our college Sunday School department. He is very devoted and tries to pull others from the school into church. In fact, after the Miami game, he flew in to OKC at like 3 in the morning so he could make it to church that morning. And my church is a good 30 minutes from OU. These are good kids. Don't even talk to me about Tim Tebow. Yeah, he's a good missionary kid and a decent player. But the fact that SI has had him on the cover twice in the last six months has burned me out. He's already won his Heisman. Let it go. Honestly, I hate Texas. I do. Orange Texas, anyway. I have a soft spot for the Red Raiders, mostly because they beat Texas last year and made colt cry. ;) I still remember that moment and it felt goooooood. But I hope Colt gets the Heisman this year. He's been in every game. He's a good player. A very good player. It's his time and I think he deserves it. But I hope we crush them today. Girl we are in the exact same boat. I also know that active is the only way for us to go and succeed. Instead of one year at a dead in job it has been 5 years for Kiale. If you are still in OK when I leave to meet Kiale in Texas maybe we could meet for lunch or something one day? I almost started crying again reading the top part of this post. I have done the same thing with some of Kiale's clothes. It is going to be so hard to let them go. From what I have heard it will be a week or two before they send us their first letter with their address. I don't' think we can get it before then. Welcome to "our family"!! :) I'll ask my husband when he gets home, how soon they can write to ya'll with their address. YAY for picking Tech over Texas. 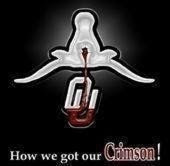 We decided today (some fellow Red Raiders and I) that we will be rooting for OU, as much as it pains us, because if/when they beat Texas, we have a better chance in the rankings for next year. I'm pretty sure I sent letters to Paul the first week he was at basic, and I got my first letter from him within the first week. The problem is they just don't have a lot of free time for letter-writing the first few weeks. I hope Colt gets the Heisman too, even though he didn't play all that stellar today...but it was a good game. I love games where you don't know who is going to win til the very end. sweet post...and when my brother went to basic, my Mom plied him with constant letters. Good luck! Hang in there! I found the lead up to DM's departure much more emotionally trying than the time he's been deployed. ]]As for the shirt, I still have one of DM's patrol caps from when we were in Iraq. It was dirty and sweaty and DM wanted to wash it before he gave it to me... not the point, dear! Good luck with basic. I can't imagine how hard it is, but know you're blogging buddies are here! and I was so dissappointed with the game. But like Sam said last night, God has a plan for him and he has put his full trust in him. I think it's awesome to know that our players have a great relationship with God! P.S. I was super dissappointed to hear that the Texas fans were cheering when Bradford got hurt. How awful...... I do understand that he got "sacked" and that it was a good play for Texas, but to cheer when it's obvious that Bradford was hurt right from the get-go.... totally direspectful. wow...thanks for the video...it is very encouraging to see men standing on their faith! I've been traipsing around my house doing chores in Joel's undershirts because they smell like him...lol I think we all have those wifely moments. Also, it took me two weeks to get an address from basic, but his group was pretty good about allowing phone calls once to twice a week they are pretty much always hurried with a drill sergeant yelling in the background but I loved getting to hear his voice. Joel did not tell me until after basic that there is a payment system for earning letters...You have to do like a base number for every letter you recieve, then if there is perfume, colored ink, lipstick kisses basically anything girly on it the "price" of the lettter can go up. Also, most of the time Joel had to read letters was after lights out so I had to think about what would be easy to read in the dark or by flashlight. Hope this helps and you are soaking up this time with your hubby!